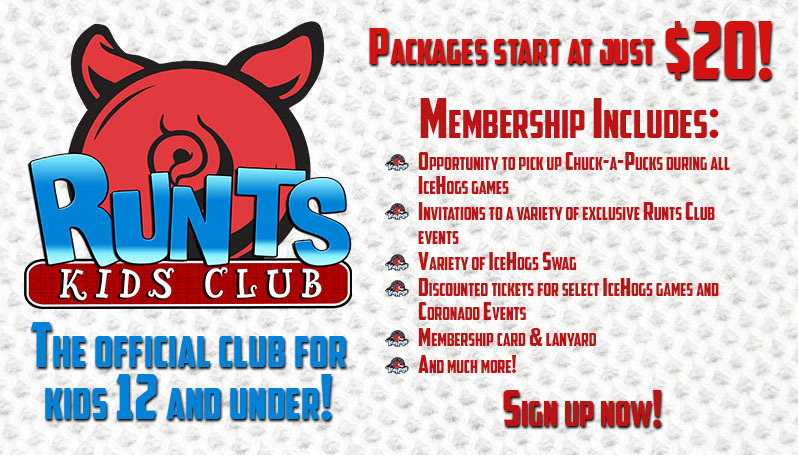 ROCKFORD, Ill – The Rockford IceHogs today announced a newly revamped “Runts Kids Club” program for the 2018-19 hockey season. Kids ages 12 and under are invited to join this year’s club to get access to a variety of great giveaways and events, including an exclusive meet-and-greet with IceHogs players. Membership begins at just $20 for the “Rookie” level package, which will include all the same benefits as last year’s Runts Club. Families will also now have the option of registering their child for an “All-Star” level membership for $40 or “Premium” package for $60 to receive additional perks throughout the 2018-19 hockey season. Registration for the 2018-19 Runts Club is currently open. To enroll or request additional information, fans can fill out the membership form at the above link and send the completed information to Pete Subsara (subsarap@icehogs.com) or the BMO Harris Bank Center (300 Elm St., Rockford, IL).